If you’re a doll-maker or a doll-lover who enjoys creating and/or displaying doll clothing, a D&K Dress Form could be a very useful and lovely addition to your room decor. 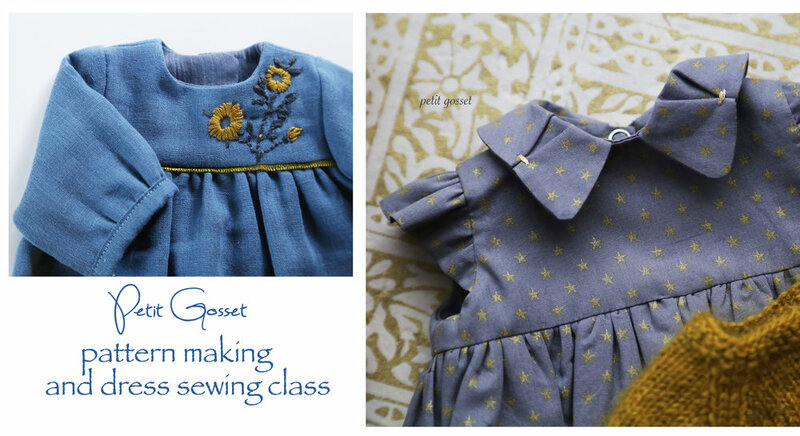 Many years ago, when I got serious about sewing and started making clothes for my children, a friend of mine, who was a designer in a dressmaking atelier, asked me if I used a dress form. The thought hadn’t even crossed my mind, and to be honest, at that point, I didn’t even know the difference between a mannequin and a dress form. I wasn’t sure I needed one, as I wasn’t going to sew for anybody else besides my children, and their sizes constantly changed as they grew. I recalled this conversation much later when I began designing clothes for dolls. I tried to find a form that could assist me throughout the construction process with draping, pinning, fitting, but also to offer me an elegant way of displaying the dresses I made. Last year, at a doll making workshop in the Netherlands, my wonderful friend Kamrin te Kronnie, the owner of the Kamrin’s Poppenatelier and the organizer of the European Waldorf Seminar, asked me to collaborate on a mannequin/doll dress form project. Though we had little idea of the long journey that lay ahead, the numerous hours of work and countless meetings that were necessary to bring out concept to fruition, now we can proudly present to you a gorgeous and at the same time very useful Doll Dress Form under the brand name of D. Gosset & Kamrin te K. (shortened to D&K). So what is the difference between a mannequin and a dress form? I figured I’d start here. A mannequin is a representation of the human body that usually has a firm torso (generally made from papier-mâché or plastic) and is used to display clothes and accessories, highlighting their attractiveness and irresistible qualities much better than a simple hanger. A dress form, on the other hand, has a body or torso made with soft material and is designed to accommodate the insertion of pins to hold fabric. It is truly helpful for the design and production of a garment, allowing the fabric to drape in a natural way. The D&K Dress Form we’re showcasing here can perform both of these functions: displaying a garment in style as well as assisting in the creation process. We’re hoping that thanks to the high quality of materials used in its production and the sleek lines of its silhouette, this new kind of dress form/mannequin will serve you for many years. The torso is hand-sewn from lovely and durable cotton canvas (or a combination of linen and cotton; both of which are pretty tough and can withstand lots of pinning) and is filled with horse hair carefully wrapped in eco-wool. Having decided to avoid any synthetic materials and use only natural fibers, we chose horse hair for its ability to hold its form for a very long time. We decided to follow the lead of high-end upholsterers of the 18th century who used this material to stuff sofas and armchairs, many of which have survived up to the present. The wool, as you may know, has exceptional qualities as well, being first and foremost, naturally mold, mildew, and fire-resistant, and is processed without the use of any chemicals. Finally, the wooden pieces have been carefully carved in Europe from a hard and beautiful beech wood, which has a warm light-reddish hue (almost a pink or flesh tone), and then reinforced with linseed oil. This elegant Dress Form is now made-to-order. If you’d like to use it in your studio or give as a gift to a friend, please contact Kamrin at kamrin.tekronnie@gmail.com. If you’re planning on coming to the European Waldorf Doll Seminar, which will take place in the Netherlands in May-June 2018, and register for a “Pattern making and dress-sewing class” with me, you will also receive this beautiful D&K Dress Form as part of the package. Let me know if you would like to find out more!